For Pierre Laurent Wantzel, 1814-1848. Project: Year of the Dragon. Wantzel is best known for proving that certain geometric tasks cannot be accomplished with straightedge and compass. The sounds in here sound to me like pipe organs and bells, but they are purely synthetic, derived from Mandelbrot and Julia sets. If you put a cosine wave into the horizontal coordinate of an oscilloscope, and a sine wave (which is the same thing, shifted 90 degrees) into the vertical, then the 'scope will trace out a circle. 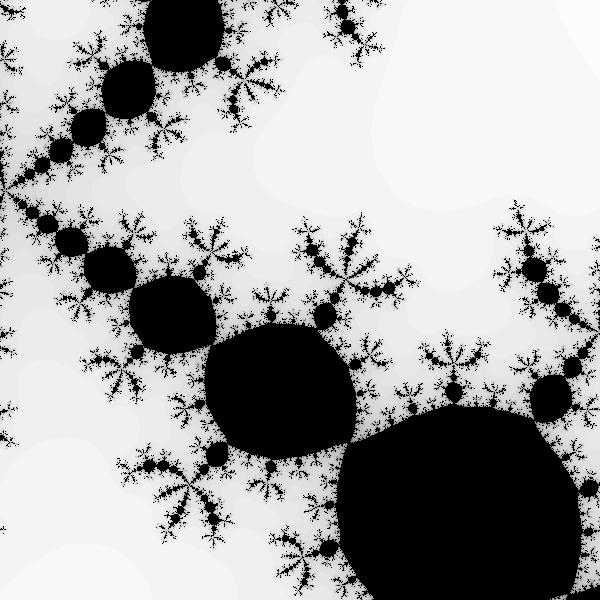 If instead it traced out a Julia set, or the boundary of the Mandelbrot set, what kind of wave would cause that and how would such a wave sound? Well, not as interesting as I'd hoped, until I layered a whole bunch of them; this is the result. The real and imaginary parts, which I had expected to be quite different, actually sound pretty much the same; see if you can figure out why. In the case of Julia sets, the waveforms contain only odd harmonics because of symmetry about the origin. The Bohlen-Pierce scale is supposed to be good for odd harmonics, and is nicely weird, so that's used throughout. The bells are a little self-indulgent, and not really very mathematically relevant, but even they have some connection to the rest of it because they are the Mandelbrot waveform again disguised with single sideband AM.